Monmouth Golf Club01600 712212work Golf - 18 holeThe course stands on high ground above the Town with superb views of the Welsh Hills, Forest of Dean and the Wye Valley. The undulating parkland course, superbly maintained throughout the year, is 5582 yards off the white tees ,5399 off yellow (Par 69, SSS 67) and 5061 yards off the Ladies’ red tees (Par 70 SSS70). Just a 25 minute drive takes you to Celtic Manor, the home of the 2010 Ryder Cup, and the club is also very easily accessible to golfers from South Wales, the Midlands, and South West England. Each aptly named hole offers a different challenge and names such as “Cannes Folly”, “Kymin View”, “The Oasis”, “The Struggle”, “Long Haul”, “Devil’s Bunker” and “Last Gasp” give clues to the test in store. The eighth hole, “ Cresta Run” was recently included in “Britain’s 100 most extraordinary golf holes” which also nominated Monmouth as having the best value green fees in the country. As you leave the clubhouse you become aware of the tranquillity of the verdant surroundings, mature trees, wild flowers and an abundance of wild life- Deer, Pheasant and Rabbit in particular. 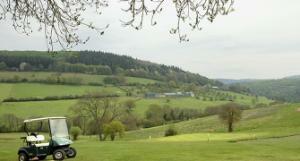 The course stands on high ground above the Town with superb views of the Welsh Hills, Forest of Dean and the Wye Valley. Visit the Monmouth Golf Club - you will not be disappointed!